This Mac Apple TV Converter Suite would help you convert DVD to Apple TV video MP4 and Apple TV audio MP3 and AAC, M4A for Mac. On the other hand, Tipard Apple TV Converter Suite for Mac ??? act the role of Mac Video to Apple TV Converter, has the ability to convert video to Apple TV on Mac. Specially, it can convert AVI, MP4, MOV, MKV, WMV, DivX, XviD, MPEG-1/2, 3GP, 3G2, VOB, etc. ...... Specially, it can convert AVI, MP4, MOV, MKV, WMV, DivX, XviD, MPEG-1/2, 3GP, 3G2, VOB, etc. video formats to Apple TV MP4 video and MP3/AAC/M4A audio on Mac OS X with lossless output quality as well as without ling time and great effort costs to perform the conversions. Tipard Apple TV Converter Suite for Mac adds the ability to optimize the output quality, such as trimming a clip of video, cropping video size, merging several video files into one file. You can also select the audio track and subtitles. It also allows you to set many parameter values, such as customize video and audio bitrate, adjust resolution, set frame rate, set audio sample rate, etc. Moreover, Tipard Apple TV Converter Suite for Mac provides you upgrading service all through your life. 4.Crop the play region of video. Qweas is providing links to Tipard Apple TV Converter Suite for Mac 3.2.16 as a courtesy, and makes no representations regarding Tipard Apple TV Converter Suite for Mac or any other applications or any information related thereto. Any questions, complaints or claims regarding this application Tipard Apple TV Converter Suite for Mac 3.2.16 must be directed to the appropriate software vendor. 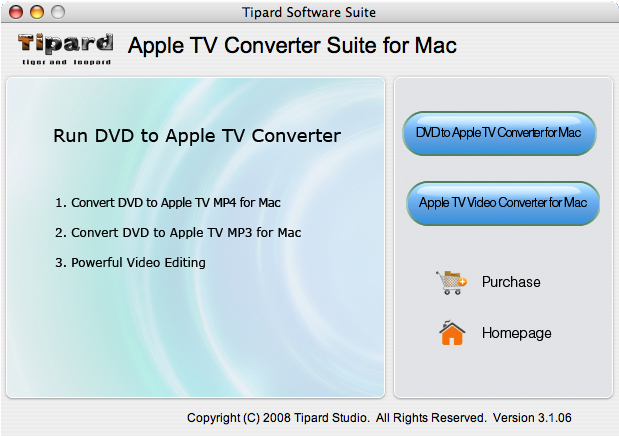 You may click the publisher link of Tipard Apple TV Converter Suite for Mac on the top of this page to get more details about the vendor.